Resomonics is Steve Foxon who is a Composer and Sound Designer. Steve has been working on Audio Dramas & Games for over 15 years. He has composed music for Doctor Who, Stargate, Warhammer, Pathfinder Legends, Deus Ex MODS and many more, with over 100 titles to his name!. You can find more information at Steve’s Website. Having composed a lot of Soundtracks, Steve decided to develop his own Sound Libraries aimed at inspiring himself and other composers when writing. Think of the sounds as a starting point for inspiration when setting out to write a new composition. He draws on his extensive experience to design sounds to cover everything from a subtle underscore to during action. If you have time, why not head on over to his Soundcloud page and take a listen to some of his compositions. Meanwhile, there are a few examples below. 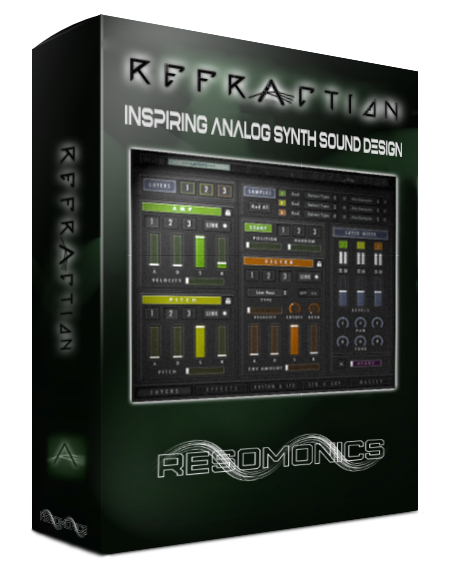 An analog sample based Synth with up to 3 layered sounds and a multitude of tools to help sculpt your own sounds. You can use the product for any commercial or non-commercial use, such as in music for Films, TV or Audio - you do not need permission from Resomonics to do so. However, the buyer cannot sell or use for profit any part of the product (the samples/ images/ patches). No part of the product can be used to make other samples libraries. The user cannot share any of the product (e.g. the samples/ scripting/ patches) with others. However, they can install the product on multiple computers that they own. Resomonics reserves the right to alter these terms at any time. Please note the Kontakt instruments will only run on the full version and are not compatible with Kontakt Player. Unless otherwise stated, Kontakt 5.5 or higher should be used. Please see the documentation that came with the instruments for the full EULA.